Most young Physical Therapists I know are having a tough time managing their finances. Student loans, rent, kids, car payments, and sometimes even mortgages. All of this demonstrates how difficult it is to attain Financial Independence. Luckily for us, there is Dr. Jim Dahle, an Emergency Physician, who has achieved financial independence in his early 40’s. He also runs a popular personal finance blog, The White Coat Investor (www.whitecoatinvestor.com) for physicians, Physical Therapists, and many other health care professionals, providing them with resources and educational information on how to get out of student loan debt, manage your finances, and invest towards financial freedom and a secure (possibly early) retirement. In this episode, Jim provides a quick financial crash course on the basics of student loan and investment management. This may be the podcast that changes your financial life! His popular 2014 book, The White Coat Investor: A Doctor's Guide To Personal Finance And Investing, has nearly 900 reviews with an average rating of 4.8 of 5 stars. It is an inspiration to many Physical Therapists and health care providers in need of financial guidance. Dr. Dahle also has thousands of subscribers on monthly newsletter, offers several personal finance online course series through his site, and runs a Facebook page as well as group for The White Coat Investor with 12,500 plus followers. Enjoy this podcast and while you are here, take a look at our Physical Therapy Continuing Education courses in travel destinations. Link to our courses HERE. Note: we recorded this in early Jan. 2019. Check out our other Podcasts HERE! Rich Willy gave us a great interview! Take a listen and check out our course with him in Austin, Tx! Rich Willy PT, PhD is one of the leading Physical Therapists when it comes to treating runners. He uses an emphasis on biomechanical analysis to treat Patello Femoral pain, Achilles tendinopathies among other ailments that are common among runners. As a runner himself, he has a unique insight of the psyche of the running athlete. This compliments his immense knowledge as a researching and practicing Physical Therapist. He teaches Continuing Education seminars for Jetset Rehab Education as well as other venues across the nation. 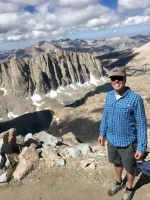 We hope you enjoy this great interview with Rich Willy and recommend taking a look at his Continuing Education course he is teaching for Jetset Rehab Education this year in Austin, Texas. Travel hacks make traveling easier. JetSet makes learning an adventure. I expected a great course from past experiences but this one exceeded them beyond imagination. In the last year, I took two Con Ed courses with Jetset Rehab Education. When I saw that they were traveling to Cabo San Lucas with Marcie Hayes and Stephanie Di Stasi, I decided to register. I expected a great course from past experiences but this one exceeded them beyond imagination. Marcie Harris - Hayes leading a lab session for Jetset Rehab Education. One could not ask for a better setting. First of all, the open air classroom was literally on the beach and had views of the famous arch of Cabo San Lucas. Instead of a white wall, the scene of the ocean, mountains, and occasional sail boat gliding by filled the space. The background sounds of waves, beach activity, and the occasional gust of warm wind were the only distractions to speak of. During the short mid lecture breaks, one could even take a quick swim and refresh in the Sea of Cortez. The course was instructed by what can only be called "Master Clinicians." Both Marcie Harris Hayes and Stephanie Di Stasi never failed (somehow) to keep the attention of the students. To be honest, as students, our attention never wavered. They were amazing. Their insight into the mind of the clinician made the material very relevant and the presentation of cutting edge evidence regarding hip dysplasia, femoral acetabular impingement and hip labral pathologies kept the course current. From left to right: Jay Bhatt, Chidi Daniel, Chris Medina, & Andre Chavez recording the Jetset Rehab Education podcast (available on itunes or all podcast platforms). 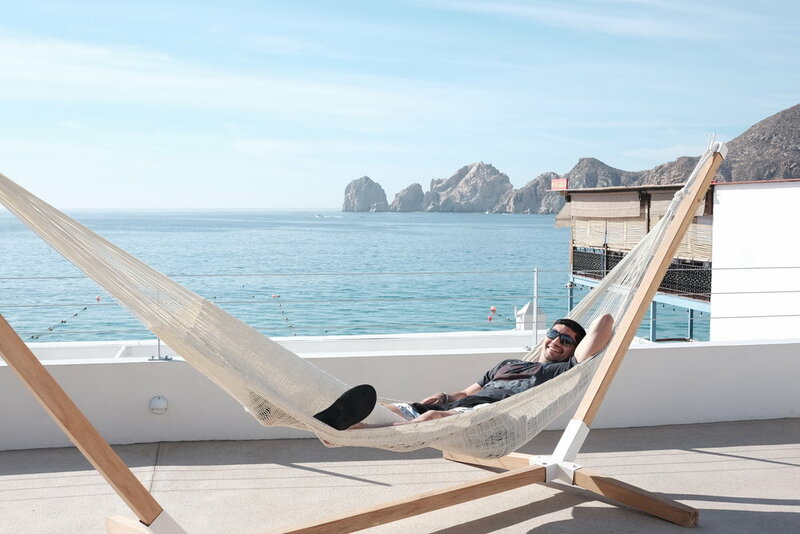 Coming soon the "Cabo Beach Episode." "For me the best part about this trip was being able to network and meet new people." Another point that I cannot forget to mention is the food! Breakfast and lunch was served complimentary for all the Jetset students at the beach club restaurant below the classroom. It was amazing. If this restaurant ( SUR Beach House ) was in my city, I would go to all the time! "Another point that I cannot forget to mention is the food!" Jetset Rehab Education co-owner Randal Glaser dining during the mid-day break. All of this considered, my favorite part about this trip was being able to network and meet new people. I was fortunate enough to spend some time with Randal and Jay (Co founders of Jetset Rehab Education) who are two amazing people that I now consider my good friends. I love what they are doing with Con Ed in the Physical Therapy community by putting on courses with great topics and speakers as well as making it a great life experience. I will say this: I am a Jetsetter for life and I will be attending as many classes as I can. See the Jetset courses open for registration now! Follow Jetset Rehab Education on social media for regular updates. Check out our Jetset courses HERE! I’ve always known that I wanted to work with the athletic patient population, and quickly learned that they can be among the most difficult patients to treat, because of the demands of needing to return to sport as soon as possible and not miss too much competition time. Further exacerbating this, every parent of a youth athlete thinks their son or daughter is the next LeBron James or Serena Williams, so they can add to the pressure to get their child back to playing. For some of these high level patients, there is even more external pressure from college recruiters or professional scouts. After PT school, I realized I lacked the confidence working with these patients. The movement faults and impairments I knew to look for in the average patient were not obviously apparent in these patients, and some of their symptoms only came on with high level activities. I was fortunate to have done a 16 week clinical internship with a phenomenal therapist (shoutout to Jeff Wang at Glendale Adventist Therapy and Wellness Center!) at the end of PT school, who pushed me to improve every day of that clinical experience. After that, I knew I wouldn’t stop continuing to seek out learning opportunities to work in this field. "The movement faults and impairments I knew to look for in the average patient were not obviously apparent in these patients, and some of their symptoms only came on with high level activities." In addition to perhaps struggling with working with athletes in the clinic, new grads are not qualified to provide sideline coverage at athletic events. The SCS is a specialty certification that designates an expert in athletic injury management, including acute care, treatment, rehabilitation, prevention, and education. Read this article for more details on why the SCS is worth pursuing if you are interested in some day providing on field coverage. "This may not be immediately obvious, but sports patients are really at the end of the day ortho patients, they just move faster." 1) Consider taking an orthopedic residency. This may not be immediately obvious, but sports patients are really at the end of the day ortho patients, they just move faster. Completing an orthopedic residency involves weekly mentoring from a clinical specialist, didactic learning, and honing in on clinical reasoning. Additionally, you can also consider a sports residency or fellowship. Here is the American Board of Physical Therapy Residency and Fellowship Education (ABPTRFE) website. 2) Familiarize yourself with the SCS application process, exam format, and test materials. Here is the American Board of Physical Therapy Specialties (ABPTS) SCS candidate guide. Each source has material to study, with practice tests. You'll have to figure out what works best for you, but as for myself I knew I needed to set up a plan to keep myself accountable. My friend and colleague from fellowship, Shemaiah Holness, assigned ourselves 1-2 chapters each from the above study materials to go over each week, and had review sessions every Sunday in which we would go over the material and practice quizzes. This worked out well for us as we didn't want to let the other down by not preparing that week. Of course, there are other study material sources, but these are what I used. Among the others I know of are Evidence in Motion and Praxis, however personally I chose not to pursue these opportunities simply because it was not financially feasible, as they are not cheap. Give yourself at least 3 months, preferably more to study and go over practice exams, and resist the temptation to procrastinate as the SCS exam is definitely not something that can be passed by cramming in the weeks leading up to it! After taking the test, you will have to wait 3 agonizing months until learning if you've passed, but if you follow the above tips, you will have prepared adequately and set yourself up for success. The SCS is definitely a certification that is worth the effort to pursue, as less than 2% of all APTA members are recognized with the credentials. Good luck! Take a Jetset Course HERE! Left to Right: Dr. Jared Vagy, DPT, OCS, CSCS aka the Climbing Dr. and Dr. Stephen Morrison DPT, OCS. In Sept of 2018 we are hosting a course in Portland, Oregon. Our instructors are two very accomplished clinicians: Jared Vagy & Stephen Morrison. They have been trained from different backgrounds with Kaiser Permanente. Using their training in both the Spine and Movement Science Fellowships, they discuss the benefits of using both the manual and movement approach. Here, you can get an eclectic viewpoint in treating the weekend warrior patient. This was a fun episode where both Dr. Morrison and Dr. Vagy take over as hosts. please comment below and let us know what you think! Dr. Jared Vagy received his Doctorate in Physical Therapy (DPT) from the University of Southern California (USC). As a Doctor of Physical Therapy in clinical practice, he completed a one-year residency program and became a Board Certified Orthopedic Specialist. He then completed an additional one-year fellowship program in Movement Science at Kaiser Permanente Hospital. Dr. Jared Vagy has published three books and numerous articles on injury prevention. He delivers seminars internationally on the topic. He is an adjunct instructor of clinical physical therapy USC in the DPT Program. He is a mentor for both the USC Physical Therapy residency program and the USC DPT program. He is on Academy Faculty for the TheraBand Academy and is on the Editorial Board for ADVANCE Physical Therapy magazine. In addition, Dr. Vagy served as a physical therapist in China for the Chinese National Track and Field Team, completed a rotation at the USA Olympic Training Center, worked with USA Track and Field at the Olympic Team Trials and covers international competitions such as the Weightlifting World Championships. He has rehabilitated several world champions, gold medalists and Olympic athletes. His assessments and treatments are rooted deeply in an understanding of the movement system. He is a firm believer in an active approach to rehabilitation and works with clients of all ability levels to achieve their maximal function. Follow us on social media to make sure you don't miss out next year's amazing courses. 2 days to go! We are super excited to meet and see each one of you in Cabo. Just wanted to send along some updates about the class. First, we did speak with the Hotel and they do offer a Shuttle service. If interested, please contact Cristina@bahiacabo.com and she'll give you the details on getting that set up for you. Lastly, wanted to remind everyone - Don't forget your passport!! The weather will be perfect for a Physical Therapy course, a sunny mid 80s day. Take a look at the amenities available at our class location. Nice right!?!? Need some reading for the plane? Try our instructor's fantastic study published in JOSPT. Need a good podcast for the flight? Look no further than the Jetset Rehab Education Podcast available on itunes and all podcast apps. We wish each and every one of you a safe trip. Below, is the course itinerary. We look forward to seeing you all there. Handouts will be provided by Jetset at the start of the course. 11:45 AM -12:45 PM - Systematic examination of the hip. Tests for source and movement system impairments. 1:45 PM - 2:45 PM - Treatment based on movement system diagnosis. 3:15 PM - 3:45 PM - Q & A. ** Handouts will be available to you at the course. disclaimer: We are not financial advisors. Correction: I mention that our guest is in his mid 30s, but at the time of the recording he is 29, he will be financially independent in his early 30s. Every now and then something simple can change your life. Often it is an idea and this idea aligns with something inside you that makes it stick. It then grows into a thought process and evolves into a major change. In my case, reading the blog The Fifth Wheel PT by Dr. Jared Casazza enacted such a change. In particular this blog post and this guest blog post led me to begin a journey that led to early student loan repayment, increasing my index fund investing (roth ira) and tracking my finances. It further led to credit card hacking with Andy Bahn and traveling to Hawaii and Las Vegas for free! Now, I know, financial independence can sound impossible for some of you. The debt can be overwhelming. Trust me, there is a way out. You just have to know down that FIRST DOMINO as they say. It is simpler that you think. It will take work, it will initially be time consuming but once you have your system in place it you don't have to think about it! I am not in anyway a financial advisor but I see finance as one of the main downfalls of our profession. I see people who are not happy with their place of work staying in jobs they dislike because of financial reasons. Finance and Ethics are very closely intertwinned and can potentially lead to people doing a poor job at getting people better because they dislike their job. I see these as potential threats to the profession of PT, further exacerbated by high student loan debt, purchases of expensive cars, buying homes, buying unneeded items at target and not putting money in a retirement fund. All of this puts financial pressure on the PT and who knows? Perhaps we are losing some amazing PTs out there because they see a profession that is not financially healthy and thus choose to do something else. For this reason I have been using this blog to help people get to the resources that can change the way they handle their business. I hope you enjoy this podcast and read a few of the resources we linked to below. My dad after shoulder surgery not following his PROM only restrictions. The holidays can be confusing for any Physical Therapist, Chiropractor, Masseuse, Occupational Therapist. The reason for this is because family members ask us for advice. Often they are the most difficult patients because they a) don't listen, b) want the quick fix, c) are intoxicated, d) they want a free massage e) don't respect you as a medical professional, (after all they knew you when you were in diapers, who can blame them?). Almost all practitioners have negative experiences that have led them to question the treatment of family members. If you think about it, this is smart. At a holiday get together we cannot chart review, there is not a treatment area, and if the word gets out, you will have a line of folks waiting to get " a freebe." There is also a chance that they will not seek treatment after the holidays thinking that your session was enough. This could prevent them from seeking the care they need. I can recall the Thanks Giving party of 2011 when I was treating a family member on someones bed and after I was done there was a line of 6 people waiting for their session! I have a big family and my day off turned into a work day. Some would call this a rookie mistake. As a Christmas morning blog post, I thought it would be a good idea to hear strategies from some seasoned Physical Therapists and how they navigate their holiday season requests. I hope the decision to treat or not treat is easier after reading this. I personally have no problem telling people "no." I've been known to say "this is my one day off, can we discuss this later?" then plan a date and time to do that. I'd rather have them see me first over someone else honestly. It depends on my mood because our job isn't a 5 minute conversation where we can give some advice and send people on their way. If I am going to help, then I know it'll be at least 30 minutes. Sometimes, if I'm feeling up to it, then I'll just do it knowing I'll have to help that relative eventually. It's easier at my own house where I have a table and stuff I need for treatment. If it's somewhere else, I'll say "tell me what's going on so that I know what to assess later when I have my table set up along with all the measurement tools I need to appropriately evaluate you." That's always a good way to listen to the person so they know you do care about them, but at least you don't have to "work" during a family function. I think overall, it's on us to be the ones to help our relatives because we know what we're doing. What are they going to do otherwise? Go see their MD that will likely just recommend meds? MOST PT's are PT's because they care about people, and want to genuinely help people get better. It's our responsibility to guide them the right way. If we feel they should go see an MD, a PT, or another health care professional, then we should be the ones to advise that, educate them on their body and give them realistic expectations on what to expect. Treating your relatives over the holidays can be an interesting task but something that all clinician will face this holiday season. Careful consideration has to take place before doing this. You know your family members better than anyone so you know who is going to listen to what you say and who thinks you don’t know anything. You also have Aunt Mildred who just wants you to push on them because it feels good. Since this is relative, (please excuse the pun) I pick and choose who I treat based off what I know about them and the situation. For example, my dad is stoic so if he is asking me for advice or for a mini-evaluation I’ll give it to him because he wouldn’t ask if he didn’t want to get better. Then you have Aunt Susanne who has Fibromyalgia and spends half of every Thanksgiving and Christmas dinner talking about her new pains and ailment . . . I wouldn’t touch that with a ten-foot pole. And then you have your cousin Ryan who you still must talk out of dumb decisions every now and again and who thinks you just gives massages anyways, I’ll pass on that one too. For me it easy it depends on the relative and the situation. Michael Curtis PT, DPT, OCS author of Why you have Bad Posture and Turn down your Pain. Here’s your script: Memorize it, repeat it, sell it, and you’re golden. If they follow up with you, you can link them to a good article while also informing them to follow up with their PT or doctor should their symptoms continue. Where do you get these online resources? You can use any trusted resource you know of (if you have some, put them in the comments below for all to see). Also feel free to use what I’ve got on MichaelCurtisPT.com – patient education articles based on body regions with exercise videos for each diagnosis. I hope this approach works as well for you as it has for me. It’s funny and bad enough when the just-met stranger at the office party or happy hour finds out I’m a Chiropractor and starts telling me about their neck and back pain and asks for a real quick free adjustment right then and there; it’s worse when it happens at the family party- because I can’t just laugh it off and walk away. These loved-ones deserve my attention and real answers. When I faced this fresh out of school, I would ask all kinds of questions and give them a ton of advice, and usually working on someone on the couch, floor, or someone’s spare bedroom. Looking back, I think I may have been eager to prove myself, or was just so happy to be able to give back to the family that I really tried to treat them as if they were in my office. The smells of a feast, screams of kids running around, and party sounds were definitely a distraction. I know better now. Nothing beats the focus, clarity of purpose, and single-mindedness of practicing in my office. Now I listen and happily give them some basic advice, (like, ice/heat/move/immobilize it) and then tell them they really need to get it taken care of. I don’t care if they see me or someone else. I offer to see family in my office for free, but tell them if they cancel or are chronically late, I will start charging them something. At least half of my family has insisted on paying anyway. 2) they don’t follow my directions, symptoms return , they come back to me, I ask them if they did what I told them to do, they say “no”, then I say “do what I told you to do”, then they never ask me again. I don’t know if the latter is a good thing or bad thing! My husband is also a PT, so there is double the chance that one of us will get summoned BUT I can say that my family and my in-laws are very respectful of my personal time at family functions (thank goodness). Their respectfulness of our time makes me more inclined to help out if the situation does arise! Please check out our 2018 courses, hope to see you next year!!!!! I am sorry to announce that our ACL Rehab course in Mammoth will be cancelled. The low snow levels among other factors have led to this decision. All who registered will receive a full refund or a credit for a future course. We are making plans to reschedule this amazing course later in 2018 so please follow us on social media to get updates on the new dates. check out our other courses in 2018 HERE. We wish all of you a happy holiday and we hope to see you in 2018. ACL rehab with two leaders in the field. Part II - The detailed card information to start travel hacking today. An introduction on "Travel Hacking" - Optimizing your credit card miles to travel for free! NEW CLASSES UP for 2018! Part II of our How to start a PT blog Podcast series. 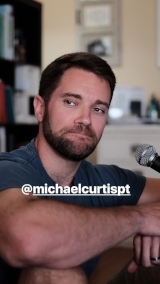 How Michael Curtis PT started his Physical Therapy Blog and how you can do it too!